Campaigners have called for action on an estate dubbed Newcastle's fly-tipping capital. Residents say Newbiggin Hall Estate has become a "dumping ground" for all manner of rubbish including fridges, wardrobes and beds. Figures released last year showed four of the 10 of Newcastle's worst streets for fly-tipping between April 2015 and March 2017 were on the estate. The city council said residential areas are swept on a 10-day cycle. 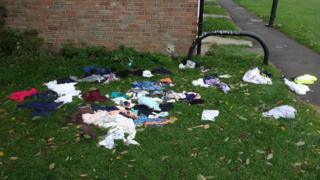 Scott Jewitt, the Conservative Party spokesman for Kingston Park South and Newbiggin Hall, said "rubbish is piling up". "There is a lot of reported litter on the estate that has not been cleared - things that have been reported a month ago. "It varies from the usual fly-tipping to fridges, wardrobes, beds and all sorts. "Sometimes, people just overturn their green bins. We saw that happen when we were out cleaning up. "The estate is a dumping ground." Members of the Newbiggin Hall under-13s football team joined in a recent clean-up of the estate, according to the Local Democracy Reporting Service. Mr Jewitt said the scale of the fly-tipping problem had been "eye-opening" for them. He added: "The field the kids play football on is an absolute disgrace, so we are going to clean that up too. "When you have the amount of rubbish that we have, it makes other people neglectful of the estate too and it reflects really badly on the area." Councillor Nick Kemp, cabinet member for the environment at Newcastle City Council, said: "Residential streets are swept on a 10-day cycle while busy areas such as the city centre are swept more often. "In the last year alone we have taken 240 prosecutions for waste crime across the city, seized 10 vans from fly-tippers and we are committed to bringing those who fly-tip before the courts."